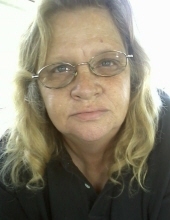 Anna Lou Housley, 60, of Baxterville, passed away Sunday, April 14, 2019 at Forrest General Hospital. Services will be Thursday, April 18, 2019 at 10 a.m. at New Life Church of God followed by burial in Baxterville Baptist Church Cemetery. Mrs. Housley was a member of Baxterville Church of God. She is survived by her husband, Terry Housley of Baxterville; four sons, Shane (Amy) Housley of Coker, AL, Josh (Leslie) Housley of Northport, AL, Billy Joe Housley of Baxterville, and Mark (Cassie) Housley of Baxterville; six grandchildren, Keelie Hayes, Lindsie Housley, Noah Housley, Star Housley, Ryleigh Housley, and McKenzie Housley; two sisters, Janice (Rex) Dennis of Baxterville and Pat Slocumb of Columbia; and four brothers, Charlie (Susan) Dixon of Purvis, Marshall Dixon of Purvis, Elmer (Sabrina) Miller of Baxterville, and Robert Dixon of Baxterville. Visitation will be Wednesday, April 17, 2019 from 5 – 8 p.m. at New Life Church of God. To send flowers or a remembrance gift to the family of Anna Lou Housley, please visit our Tribute Store. 1482 Purvis to Baxterville Rd. "Email Address" would like to share the life celebration of Anna Lou Housley. Click on the "link" to go to share a favorite memory or leave a condolence message for the family.